Start with when your beach wedding will take place. The islands are especially attractive in the northern-hemisphere winter months because Hawaii’s temperatures are consistently mild all year round. Keep in mind that those popular winter months for visitors (November-March) are the months local people will indicate when you ask them when the “rainy season” falls, and that’s also when the prices go up. Often, it will rain steadily for days or even weeks at a time during that period, but it’s impossible to predict just when that time will be. For the most part, it rains a little just about every day year-round on all the islands, usually in the mornings in the mountain valleys and on the windward sides. Nobody cares — or even seems to notice. Most umbrellas in Hawaii are used to ward off the sun, not the rain. 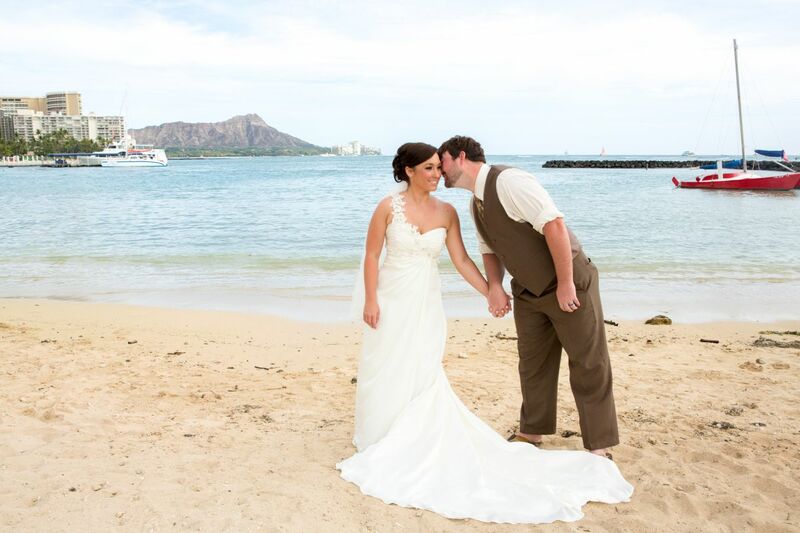 Once you’ve decided on the time of year, give yourselves a year or so for planning your wedding in Hawaii. You want to be able to have a choice of accommodations, venues, amenities, caterers, etc., and the choices become limited if you don’t start early enough. And you’ll have to consider travel arrangements and lodging for your wedding party and any traveling guests. What kind of wedding are you thinking about? While you might be thinking of a traditional ceremony at a denominational church in a lovely island setting, it’s hard to resist a beautiful beach with a “Hawaiian” flavor (featuring Hawaiian wedding traditions, Hawaiian décor, Hawaiian food, Hawaiian music and Hawaiian dancing). What is the licensing process? What will you and your party wear? Will a reception be part of the package you put together? Will you want flowers and/or music? How will everyone find and get to the venue you select? Will you stay in the islands for your honeymoon? On the same island? There’s a lot to plan. Get busy! 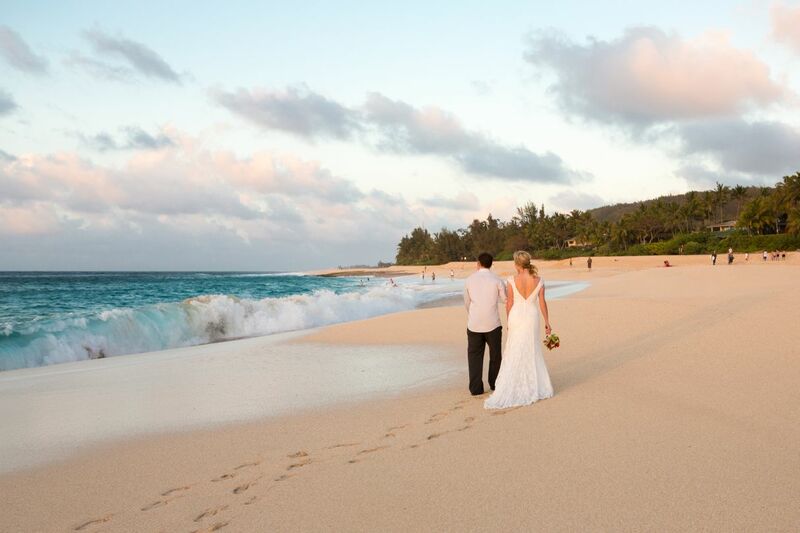 You will, of course, plan your Hawaii beach wedding carefully, hopefully with some professional help. But regardless of how carefully you prepare, some innocent phenomena can sneak up and bite you. When the trade winds blow (and they usually do), the weather is lovely, but the wind can get pretty strong, especially on the beach. Chiffons and China silks are not ideal choices for the bride’s gown or your bridesmaids’ dresses. Members of the wedding party, as well as guests, should prepare their hair accordingly, with pomade or gel. Not just the wind, but also the breaking waves can seriously affect the outdoor acoustics. Consider a sound system with clipped-on mikes for the bride, groom and officiant. If you have a band or a DJ, you probably can do that through them. Your natural setting might need grass mowed and raked, the beach raked and policed, and the flower situation investigated. If the beach is lined with flowing plants that’s great, but you might need to bring along some flowers of your own. You may want to add a trellis or an arch, torches or lanterns, or even strings of lights. If you hire a local catering company, its people will be prepared; but be sure to avoid mayonnaise-heavy salads or items that require low temperatures to be palatable. It gets hot on the beach! Alcohol is prohibited on beaches in Hawaii. If your guests have imbibed before the ceremony, remember that alcohol dehydrates, so it’s a good idea to have plenty of soda or punch, ice and water on hand.